Hello friends! Stephanie here! I had so much fun creating today’s design team project, I couldn’t stop at just one card. I’ve included a process video below, along with some different variations of my original design. Some are more traditional and some a little more whimsical and colorful. 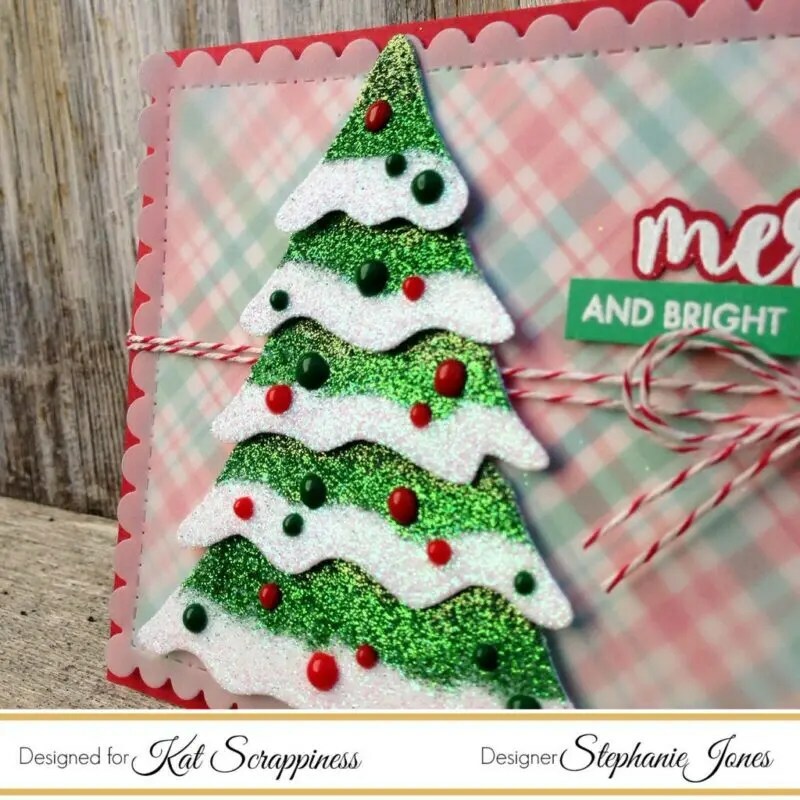 This Christmas Tree Die, which is exclusive to Kat Scrappiness, is one of my absolute favorites this season. I started out by adhering some 6×6 sheets of Scor-Tape to a piece of cardstock and cut the Christmas Tree die from that. I used some of the Nuvo Glitters in Diamond, Olive Green, and Green Meadow to coat each layer of the tree. I used my finger to rub the glitter into the adhesive, and then brushed the excess off with a paint brush. These glitters are fairly new to Kat’s shop and so far I love them. They’re very fine, which is something I look for in a glitter. 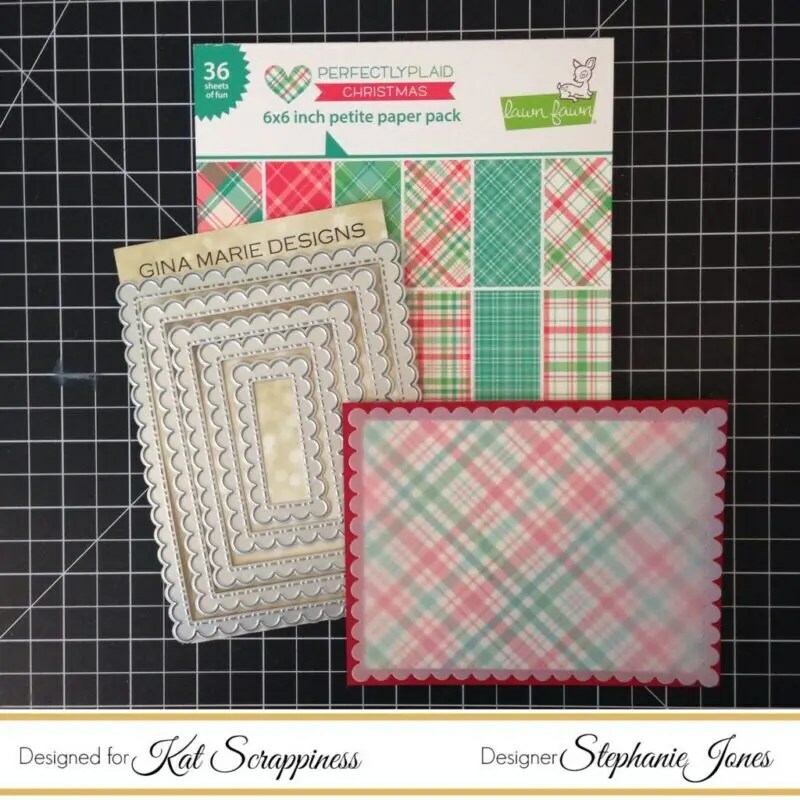 I used my favorite plaid paper from the Lawn Fawn Perfectly Plaid Christmas pack for my background. I placed a piece of vellum over top, which is cut using the Stitched Scallop Rectangle dies by Gina Marie Designs. Before assembling the card I added a bakers twine bow and some foam tape to the bottom of each layer on the tree for some added dimension. I embossed my sentiment and cut around the “Merry” so it stands out against the background. You may have heard me talk about the Avery Elle Merriest stamp set before – it’s a wonderful set with sentiments for every occasion. I highly recommend it as a staple in your stamp collection. 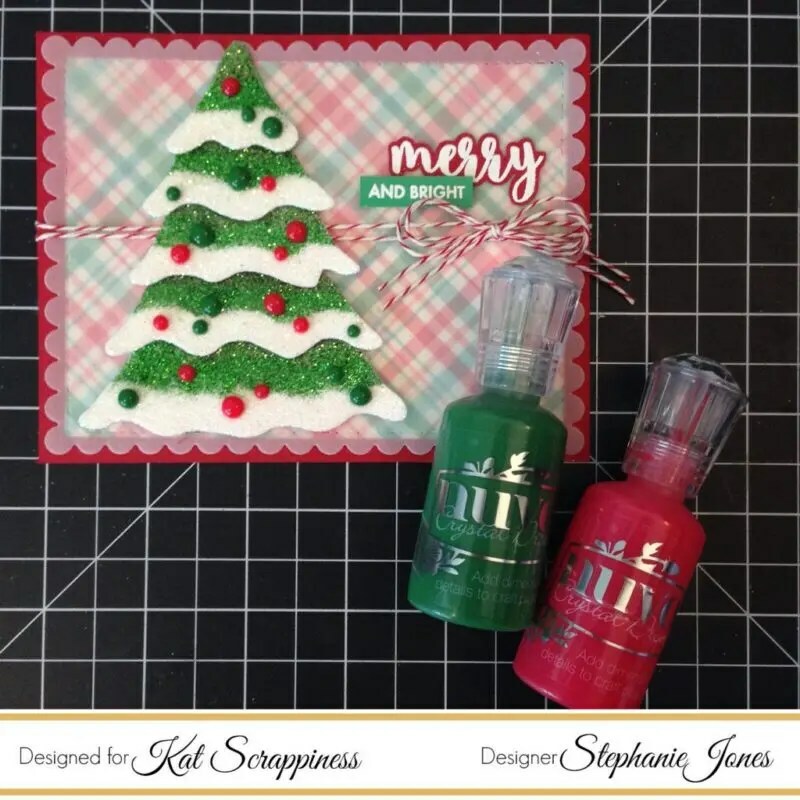 To finish off the card I added some ornaments using Nuvo Crystal Drops in Woodland and Red Berry. Because I had so much fun with this card design I created a few more variations, which I’ll share below. Leave me a comment and let me know which style you prefer! Thank you so much for stopping by! I’ve included links to all of the products used below. Oooh…ahhhhh… can’t pick a favorite! I just purchased this die and now I can’t wait to use it. Thanks for the inspiration. Awe Thank you so much! You’ll love this die! 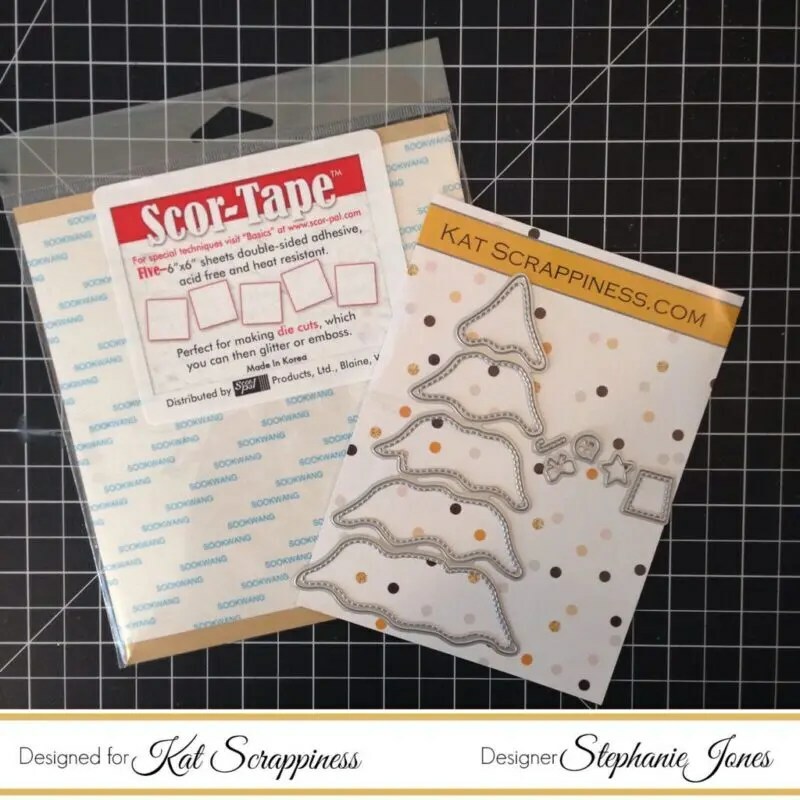 Be sure to search the Kat Scrappiness blog for more inspiration using it – there are endless possibilities. There’s even a super cute Halloween tree! OMG! so pretty! awesome inspiration!